Solid tumors are a mixture of many different cell types from various lineages. Identification and quantification of the various lineages and cell subsets found in tumor tissue can be accomplished based on combinations of origin-dependent cell surface and intracellular markers. Cancer stem cells (CSC) Highly variable (reports of 0.0001–40%) CD133, CD44, CD24, EpCAM, ABCB5, CD200. Combinations of these markers are most effective for detection. Possess self-renewal and differentiation capacity and are involved in tumor growth and metastasis. Tumor-infiltrating lymphocytes (TIL) 2–50% CD45 in addition to subpopulation-specific surface marker combinations Different immune subpopulations exhibit either tumor-suppressive or tumor-promoting functions. Fibroblasts Can cover >50% of the area inside and around the tumor in tissue sections, but the frequency is typically low. CD44, CD90, vimentin. Usually marker combinations are required, such as EpCAM–/CD45–/CD90+ Modulate tumor extracellular matrix. Can transform the tissue into dense fibrotic structures (desmoplasia). Active role in tumor growth promotion and metastasis. Tumor cells inside a solid tumor are often outnumbered by stromal cells in many tumor entities. A prominent example is pancreatic cancer, where frequently less than 10% (data from Miltenyi Biotec R&D) of all cells inside the lesion are tumor cells (PMID: 14625861). The expression of cell surface markers on tumor cells highly depends on the cells' origin. Epithelial markers such as EpCAM or E-cadherin are most commonly used to detect tumor cells. In addition, intracellular markers, such as lineage specific cytokeratin subtypes, can also be used. The existence of cancer stem cells (CSCs) is a much debated question. Yet, this cell type is intensely studied and has been reported to be present in several solid tumors, including brain, breast, colon, ovary, pancreas, prostate, skin cancers, and multiple myeloma. As cells with the potential to self-renew and give rise to all cell types found in a tumor, CSCs are implicated in relapse and metastasis, and thus are interesting targets for cancer therapies. Studies have reported a broad range of CSC frequencies in tumors, which led to discussions about possible phenotypic switching and the impact of experimental methods on CSC function (PMID: 27121191, 23950884). The most complex lineage of non-malignant cells infiltrating a tumor are immune cells. All immune subpopulations can be found in a tumor and each exerts either tumor-suppressive or tumor-promoting functions. Cytotoxic T cells, T helper cells, and M1 macrophages are tumor-suppressive, whereas regulatory T cells or M2 macrophages usually promote tumor growth (PMID: 24122236). The frequency of TILs is highly variable and ranges mostly between 2% and 50%. The overall TIL population can be detected easily by their ubiquitous and specific expression of CD45, and dozens of TIL subpopulations can be defined by the expression of surface marker combinations. Cancer-associated fibroblasts play a key role in modulating a tumor’s extracellular matrix and can transform tissue into dense fibrotic structures (desmoplasia), a common phenomenon in many carcinomas, including breast and pancreatic cancer (PMID: 14581350). Fibroblasts also play an active role in tumor growth promotion and metastasis, as they secrete cytokines and pro-tumorigenic extracellular matrix molecules (PMID: 19308067), for example. Tumor tissue sections can include fibroblasts inside the tumor and in the surrounding tissue. At times, fibroblasts cover more than 50% of the section area due to their large size and deposition of extracellular matrix that fills a significant portion of tumor space. Their actual frequency, however, is quite low. Fibroblasts express CD44, CD90, and vimentin. As these markers are also expressed by other lineages inside the tumor, marker combinations like EpCAM–/CD45–/CD90+ are used to identify fibroblasts. To ensure oxygen and nutrient supply, tumors induce vascularization, which involves accumulation of endothelial cells and pericytes. However, the frequency of these cell types is usually below 4%. Endothelial cells can be detected using a broad range of markers including CD31, CD144, CD34, and CD146. However, specific detection also requires marker combinations such as CD45–/CD31+. Miltenyi Biotec has created dedicated application protocols to isolate and characterize different cell types from tumor tissue. Tumor tissues must be dissociated into single-cell suspensions for many downstream applications, including isolation of cell subpopulations, cell culture, or flow cytometry analysis. For tumor tissue, this may require use of digestion enzymes. For details, see the MACS Handbook chapter Human cells and organs – Tumor tissue. Miltenyi Biotec has developed numerous products for the magnetic separation of the various cell types that can be found in tumor tissue. For details on MACS Cell Separation Technology, see the MACS Handbook chapter Magnetic cell separation. Solid tumors are infiltrated by cells of non-tumor origin, including heterogeneous lymphocyte subpopulations, fibroblasts, and endothelial cells. Amount and composition of infiltrating cells are highly variable and patient dependent. The presence of these cells interferes with downstream analyses of tumor cells in many regards. Material from infiltrating cells can hybridize to probes on microarrays and significantly reduce sensitivity of next-generation sequencing or proteome analyses. Moreover, cultures of human tumor cells are frequently hampered by fibroblasts overgrowth, which can bias assays such as drug sensitivity tests. To overcome these limitations, Miltenyi Biotec has developed the Tumor Cell Isolation Kit, human, a fast and easy method to isolate untouched human tumor cells from primary tissue. The procedure of this kit comprehensively depletes cells of non-tumor origin from the sample through the combination of automated tissue dissociation and magnetic cell sorting. The negative selection strategy enables isolation of the tumor cell population without foreknowledge of the tumor cells' surface protein expression. Tumor cells can be isolated to purities of higher than 95% in less than 20 minutes, even from tissues with initially low numbers of tumor cells (<20%). Scientific posters describing the use of Miltenyi Biotec's Tumor Cell Isolation Kit can be downloaded from the related resources panel to the right. Tumor Cell Isolation Kit, human. Tumor cells isolated to high purity with the Tumor Cell Isolation Kit, human. Human tumor tissue was dissociated into a single-cell suspension. Subsequently, tumor cells were isolated and cultured for 7 days. Unseparated cells were cultured in parallel as a control. (A) Unseparated fraction, (B) untouched tumor cells isolated using the Tumor Cell Isolation Kit, human. Cells in both images are stained for vimentin (red), EpCAM (green) and DAPI (blue). During the growth phase in vivo, xenografted tissue is vascularized and infiltrated by cells of murine origin, including heterogeneous lymphocyte subpopulations, fibroblasts, and endothelial cells. The level of infiltration is highly variable and depends on multiple factors like tumor subtype, growth rate, and region of transplantation. Contaminating mouse cells can lead to cross-hybridization of murine material with human probes on microarrays, and mouse signals can significantly reduce sensitivity of next-generation sequencing and proteome analysis. Moreover, cultures of human tumor cells are frequently hampered by mouse fibroblasts that efficiently attach to the plate and overgrow the target cells. The Mouse Cell Depletion Kit offers a fast and easy method for comprehensive depletion of all murine cells from xenograft tissues. Even from tumors with high numbers of mouse cells (>60%) human tumor cells can be isolated to purities greater than 98% in less than 20 minutes (PMID: 26607327, 27501218). Depletion of mouse cells is based on mouse-specific antibodies. Therefore, the human target cells remain “untouched”. Importantly, the procedure can be used for any xenograft material, without the need for a specific marker expressed on the human cells. High purity of human tumor cell population isolated from xenograft tissue by the Mouse Cell Depletion Kit. Xenograft tissue was dissociated into a single-cell suspension. Subsequently, tumor cells were isolated and cultured for 3 days. Unseparated cells were cultured in parallel as a control. (A) Unseparated fraction, (B) human tumor cells isolated using the Mouse Cell Depletion Kit. Cells in both images are stained for vimentin (red), EpCAM (green) and DAPI (blue). Growing knowledge of tumor heterogeneity has increased the importance of analyzing tumor-resident and stem cell subpopulations. Cancer stem cells (CSC), or tumor-initiating cells, have gained substantial interest in oncology as they play a crucial role during tumor growth and metastasis. Isolation and analysis of CSCs, even from single tumor entities like melanoma, has resulted in contradictory results among different research groups. Some of this variation can be explained by the different dissociation and isolation methods used. The procedure used for dissociation of primary tissue prior to staining can cause technical bias: Aggressive proteases, such as trypsin, cleave off several CSC surface markers like ABCB5 or CD44, and thus may result in incorrect profiles of the differential expression of sensitive markers (PMID: 21393506). Glycosylation and splice isoform–dependent epitopes, as found for CD24 or CD133, are differentially expressed among tissues and cell states, which impacts antibody-based assays. For example, the AC133 epitope but not the entire CD133 protein expression is lost upon CSC differentiation (PMID: 20068153), which can affect cell separation and analysis. Miltenyi Biotec offers a range of MicroBeads conjugated to monoclonal antibodies specific for the most important CSC markers, as well as dedicated kits, such as the CD133 MicroBead Kit – Tumor Tissue, human. Automated (and therefore user-independent) procedures for the dissociation of human and mouse tumor tissue preserve cell surface epitopes and yield large amounts of single cells with approximately 90% viability – a prerequisite for subsequent cell isolation and analysis. Antibody conjugates that recognize epitopes relevant for CSC analysis, and which were tested on cell lines and primary tumor tissue, allow quantification and isolation of CSCs. 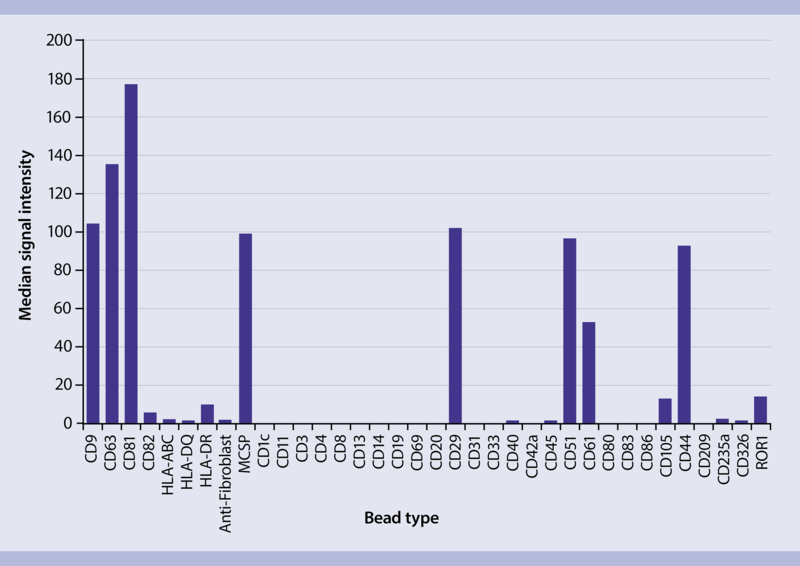 For example, a sequential sorting approach enabled efficient isolation of highly viable populations of CD45–CD24–CD44+ breast CSCs and improved molecular characterization by next-generation sequencing–based transcriptome profiling (PMID: 22771536). Isolation of human retinoblastoma cells to high purities by the CD133 MicroBeads – Tumor Tissue, human. CD133+ human retinoblastoma cells (WERI-Rb-1) were isolated from a mixture of U937 and WERI-Rb-1 cells using CD133 MicroBeads – Tumor Tissue, an MS Column, and an OctoMACS™ Separator. Cells were fluorescently stained with Labeling Check Reagent-PE and CD44-APC and analyzed by flow cytometry using the MACSQuant® Analyzer. Cell debris and dead cells were excluded from the analysis based on scatter signals and propidium iodide fluorescence. Isolation of human retinoblastoma cells to high purities by the CD133 MicroBeads – Tumor Tissue, human. CD133+ human retinoblastoma cells (WERI-Rb-1) were isolated from a mixture of U937 and WERI-Rb-1 cells using CD133 MicroBeads – Tumor Tissue, an MS Column, and an OctoMACS™ Separator. Cells were fluorescently stained with Labeling Check Reagent-PE and CD44-APC and analyzed by flow cytometry using the MACSQuant® Analyzer. Cell debris and dead cells were excluded from the analysis based on scatter signals and propidium iodide fluorescence. Immunotherapy against cancer, based on T cells attacking the tumor, has proven clinical efficacy for multiple tumor entities. Primary human tumors are the optimal system to analyze effects of immunotherapy due to their fully competent immune-repertoire. However, amounts and composition of TILs are highly variable, which complicates the targeted analysis of subpopulations. Moreover, small subpopulations might escape analysis as they can be lost in the background noise. Immunophenotyping of TILs by flow cytometry is time consuming and subsequent data processing is work intensive, making pre-enrichment for sample debulking attractive. Miltenyi Biotec offers an automated workflow combining tissue dissociation with TIL-specific isolation to improve and accelerate downstream analysis. Tumor dissociation is automated on the gentleMACS™ Octo Dissociator and optimized for epitope preservation to prevent the bias in immunophenotyping caused by aggressive and impure enzymes. A list of preserved epitopes can be downloaded from the related resources panel to the right. Enrichment of untouched TILs is achieved by depletion of non-TIL populations (debulking) using a combination of CD326 (EpCAM) MicroBeads to remove tumor cells, and Anti-Fibroblast MicroBeads to remove fibroblasts. Numerous cell separation reagents specific for TIL subpopulation are also available. To learn more, refer to the chapter on the cell of interest. Characterization of circulating tumor cells (CTCs) from blood or disseminated tumor cells (DTCs) from bone marrow is important to understand the mechanisms of cancer metastasis. Levels of CTCs in blood have been linked to patient prognosis and treatment. CTCs and DTCs are very rare, so highly sensitive methods are needed to enrich them for downstream morphological staining or molecular analysis. A number of Miltenyi Biotec kits and reagents have been optimized to efficiently isolate tumor cells from whole blood (StraightFrom® Whole Blood CD326 (EpCAM) MicroBeads, human) and blood products (e.g., CD326 (EpCAM) Tumor Cell Enrichment and Detection Kit, human). Each product addresses different experimental needs. For example, the Carcinoma Cell Enrichment Kit, human and the Carcinoma Cell Enrichment and Detection Kit, Immunocytochemistry, human use Anti-Cytokeratin MicroBeads to capture and analyze disseminated epithelial tumor cells. Similarly, the ErbB-2 Tumor Cell Enrichment and Detection Kit, human combines separation of ErbB-2+ cells and intracellular staining of cytokeratin filaments to analyze tumor cells overexpressing the human epidermal growth factor receptor by light microscopy. Effective separation of tumor cells from whole blood. Whole blood samples were spiked with cells from a breast cancer cell line (SK-BR3). The tumor cells were then enriched directly from the samples using StraightFrom Whole Blood CD326 (EpCAM) MicroBeads and the program Posselwb on the autoMACS® Pro Separator. Cells were fluorescently stained with CD326 (EpCAM)-FITC and CD45-VioBlue® and analyzed by flow cytometry using the MACSQuant® Analyzer. Cell debris and dead cells were excluded from the analysis based on scatter signals and propidium iodide fluorescence. In tumor tissue, frequencies of endothelial cells and pericytes are low. Therefore, pre-enrichment of these cells is necessary for most downstream assays. An initial depletion of CD45+ cells prior to endothelial cell enrichment allows a more specific isolation using CD31, CD144, CD34 and CD146 MicroBeads. Miltenyi Biotec also offers dedicated kits like the EPC Enrichment and Enumeration Kit and the cEC Enrichment and Enumeration Kit, which include all reagents needed to enrich and enumerate endothelial progenitor cells (EPCs) or circulating endothelial cells (cECs). EPCs are enumerated based on the expression of CD34, CD133, and CD309, whereas cECs are detected based on CD34 and CD146, and the lack of CD45. Enumeration of CD34+CD133+CD309 (VEGFR-2/KDR)+ EPCs in a pre-enriched EPC sample. Leukocytes after discrimination of debris and platelets, exclusion of dead cells and monocytes are shown. Additionally, data were gated on CD34+ cells. Cells were stained with CD309 (VEGFR-2/KDR)-APC and CD133/2 (293C3)-PE and analyzed by flow cytometry. Enumeration of CD34+CD133+CD309(VEGFR-2/KDR)+ EPCs in a pre-enriched EPC sample. Fibroblasts express markers such as CD44, CD90, and vimentin. As these markers are also expressed by cells from other lineages inside the tumor, marker combinations like EpCAM–/CD45–/CD90+ are useful for the isolation and detection of cancer-associated fibroblasts. MACS MicroBeads are a flexible solution to create combinations that address specific experimental needs, either as a means of depleting non-target cells like epithelial cells using the CD326 (EpCAM) MicroBeads, human, or leukocytes using CD45 MicroBeads, human, or to select specific target cells. 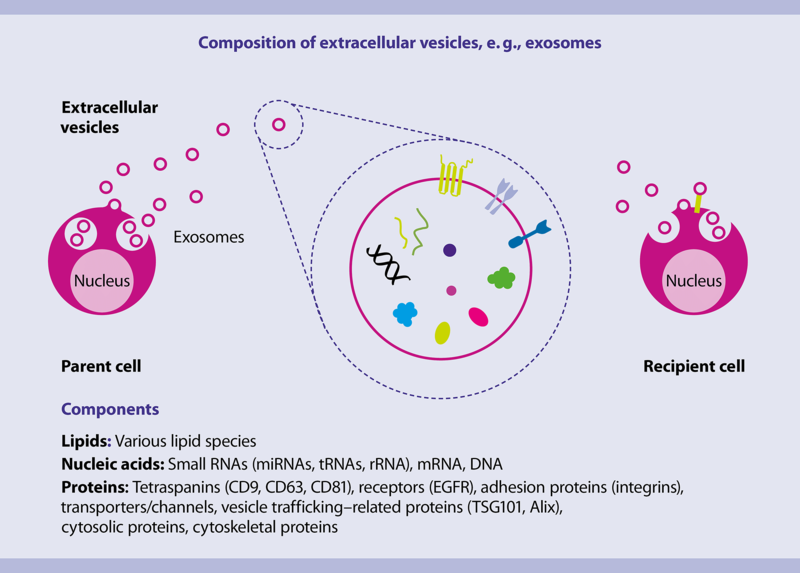 Exosomes are extracellular vesicles (EVs) released by a variety of cell types either constitutively or after stimulation. EVs carry proteins, lipids, and nucleic acids like miRNAs, mRNA, or even fragments of genomic DNA, and are important means for intercellular communication and transport. Exosomes are released from a parent cell and are engulfed by a recipient cell. Exosomes can transport a large variety of nucleic acids, lipids, and proteins. Markers found on the membrane of exosomes are equal to those found on the parent cell, giving insight into the origin of an exosome. Exosomes are released from a parent cell and are engulfed by a recipient cell. Exosomes can transport a large variety of nucleic acids, lipids, and proteins. Markers found on the membrane of exosomes are equal to those found on the parent cell, giving insight into the origin of an exosome. Isolation and analysis of EVs provides insight into physiological and pathological processes within the body. Where originating cells are difficult to access, exosomes can be used to gain information about these cells. Exosomes secreted by tumor cells can be found in plasma or urine, and thus, are important constituents of so-called liquid biopsies. DNA extracted from plasma EVs has been used for whole genome sequencing (PMID: 26681674; 24398677). The resulting data enable the reconstruction of the mutation profile of the tumor and can be more comprehensive than a profile of a tumor biopsy. The vesicles can derive from metastatic sites and therefore might represent mutations that are not present in the originating tumor. Tumor exosomes also play important roles in tumor progression (PMID: 24766647). They can induce angiogenesis, suppress immune responses, and route metastasis. In a tumor mouse model, mice pre-treated with exosomes derived from a metastatic cell line exhibited metastasis even when tumor cells from a non-metastatic tumor cell line were transplanted (PMID: 26725371). Given that the target region for metastasis can be influenced by EVs ((PMID: 26524530), tumor exosomes may support CTCs in homing to distant tissue. If EVs from tumor cells preferentially metastasizing to the lung are used to pre-condition mice, most metastatic sites are found in the lung. This holds true even if the tumor cells used to generate the tumor are derived from a tumor that usually would mainly colonize bone marrow. Basic research and future diagnostic applications demand reliable methods for exosome isolation. Due to their small size (ca. 100 nm), exosomes are conventionally isolated by ultracentrifugation (PMID: 24009894), which requires costly equipment and is typically performed for several hours or even overnight. High starting volumes (>10 mL, often 50–100 mL) and low yields make isolation of exosomes from precious samples like patient plasma difficult, if not impossible. Density gradient centrifugation improves purity of isolated exosomes over traditional ultracentrifugation. Precipitation of exosomes by volume-excluding reagents like PEG is fast and inexpensive, but coprecipitation of lipids or protein aggregates reduces exosome purity. Ultrafiltration or size exclusion can also be used to enrich small vesicles, though vesicles can attach to the membrane or block the filters, making yields low and unreliable. MicroBeads enable exosome isolation by selecting EVs according known exosome surface markers, like CD9, CD63, CD81, or all three markers concurrently (Exosome Isolation Kit Pan, human). EVs not carrying the respective markers are depleted and thus, sufficient amounts of vesicles can be isolated from as little as 0.5 to 2 mL of cell culture supernatant, urine, plasma, serum, ascites etc. The main applications for MicroBead-based isolation are EV analysis by downstream assays like Western blot, MACSPlex Exosome Kit, and the analysis of exosomal RNA. The expression of cell surface markers on tumor cells that can be used for flow cytometry analysis is highly dependent on the cells' origin. Epithelial markers such as EpCAM or E-cadherin are commonly used to detect tumor cells, while the ubiquitous and specific expression of CD45 can be used to detect TILs. Fibroblasts express markers such as CD44, CD90, and vimentin. Nevertheless, lineage-specific cytokeratin subtypes, as well as combinations of surface and internal markers are needed for the specific discrimination of different cell types, subsets and subpopulations. A suitable flow cytometry antibody panel for the characterization of major tumor lineages in carcinomas is CD90/EpCAM/CD31/CD45/Gly-A. A list of Miltenyi Biotec cancer-related antibodies can be downloaded from the related resources panel to the right. For details about Miltenyi Biotec antibodies and dyes for cell analysis, see Flow cytometry – primary antibodies. The tetraspanins CD9, CD63, or CD81 are used as exosomal markers (PMID: 9685355), while surface proteins derived from the membrane of releasing cells enable inferences about cell origin (PMID: 12154376). Nevertheless, the small size of exosomes (30–100 nm) makes it difficult to analyze them directly by flow cytometry (PMID: 25688721). Miltenyi Biotec established a multiplex bead-based assay consisting of capture and detection antibodies for flow cytometry analysis of the exosome surface protein composition (PMID: 26901056). The MACSPlex Exosome Kit is an easy and fast method to analyze 39 surface proteins, including 2 negative controls, on extracellular vesicles. Each bead population carries a monoclonal antibody recognizing a surface epitope. By incubating the MACSPlex Beads with the exosome sample, vesicles are captured by the respective beads. The bound exosomes are then stained with APC-conjugated antibodies. With a diameter of about 4.8 µm, single beads can easily be detected in the forward/sideward scatter gate of the flow cytometer. Workflow of the multiplex bead-based assay of the MACSPlex Exosome Kit, human. Isolated exosomes are incubated overnight with 39 differently labeled beads, each coupled to a different capture antibody. Bound exosome are detected with APC-conjugated antibodies. Workflow of the multiplex bead-based assay of the MACSPlex Exosome Kit, human. Isolated exosomes are incubated overnight with 39 differently labeled beads, each coupled to a different capture antibody. 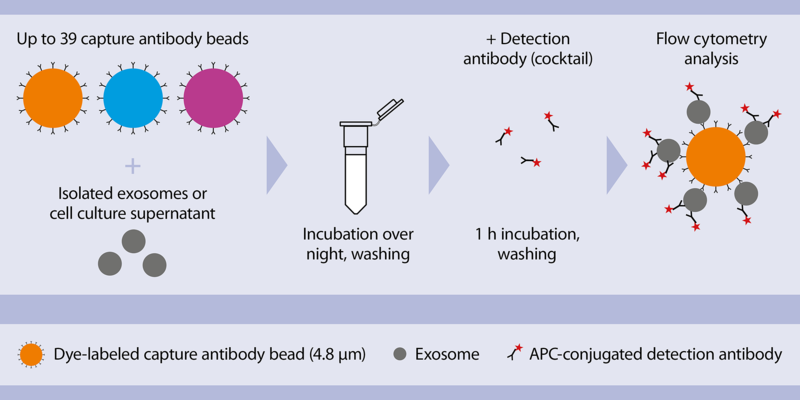 Bound exosome are detected with APC-conjugated antibodies. Flow cytometry analysis of exosomes by the MACSPlex Exosome Kit. Example of analyzed exosomes showing (A) gating according to bead size, (B) discrimination of differently labeled bead populations, and (C) measurement of signal intensities of the single bead populations. Flow cytometry analysis of exosomes by the MACSPlex Exosome Kit. Example of analyzed exosomes showing (A) gating according to bead size, (B) discrimination of differently labeled bead populations, and (C) measurement of signal intensities of the single bead populations. The 39 bead populations are distinguished by different fluorescence intensities detected, for example, in the B1 (FITC) and B2 (PE) channels of the MACSQuant® Analyzer 10. The recorded APC signal intensity of each population corresponds to the number of vesicles bound to the respective bead type. The obtained surface protein profile of the vesicle population can be used to characterize and compare exosome populations from different cell types, stimulated vs. non-stimulated cells, or treated vs. non-treated cells, for example. Median signal intensity of the markers represented in the MACSPlex Exosome Kit. Signal intensity was analyzed with the Express Mode of a MACSQuant® Analyzer. Median signal intensity of the markers represented in the MACSPlex Exosome Kit. Signal intensity was analyzed with the Express Mode of a MACSQuant® Analyzer.